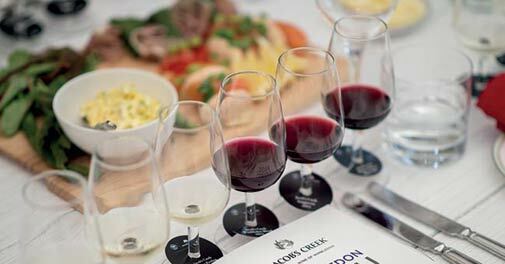 Jacob's Creek, the official wine at Wimbledon, embodies the versatility of tennis' best-loved grand slam. Prachi Bhuchar explores the spirit behind the sportsmanship. It has glints of the grass in its paleale complexion; a thousand strands of flax burnt in the sun and bottled. A swig of sparkling sunshine later, you are in love with the Jacob's Creek Wimbledon blend, which is a blend of white grape varieties - Sauvignon Blanc, Riesling and Pinot Grigio, with a dash of White Frontignan. Making it even more attractive is the exclusivity; you can't buy it anywhere, the wine can only be savoured at the hospitality marquee at the game. I can't believe I am at Wimbledon with the special blend in hand, watching Federer and Djokovic put up a mean show. Every year, this is where royalty happily rubs shoulders with Hollywood, other athletes, musicians and anybody who is a somebody. 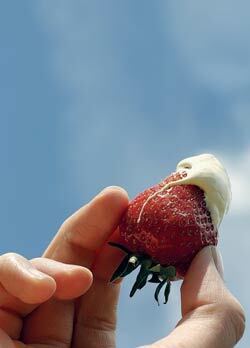 Here at Wimbledon, sport and excess hook up to create the year's biggest 'It' event. When Wimbledon arrives in England, you know the season has turned. The smell of freshly cut grass, the promise of strawberries fresh from Kent and sunshine, bare feet, hats, red-sole heels, shorts, Burberry, wine-all the trappings of an extraordinary British summer. 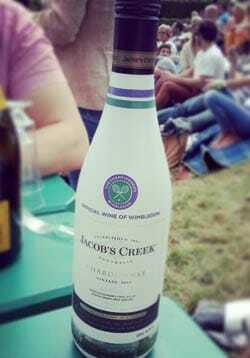 Chasing the Wimbledon dream is a brand that's the official wine of the tournament: Jacob's Creek. Bringing a touch of Australian whimsy and lassitude to the game for four years running, it represents a perfect marriage between the two. Wine spitzers line a neat tray waiting to be picked up as we make our way into the Jacob's Creek hospitality marquee before the game. We are pleased as punch as the hint of wine, crushed ice and sweetness hits our throat. Much like the event, the wine brings about a sense of freedom and indulgence and, depending on who's drinking it, plays all tunes ranging from bohemian rhapsody to Tchaikovsky. Versatility defines this wine and the game. The special 'all white' edition Wimbledon wine has lined the shelves at supermarkets across Britain all of June, and is a worthy piece of memorabilia; it also helps that it tastes so darn good. Made from grapes grown in Australia's Barossa valley, the chardonnay is easy on the tongue, its velvety fragrance reminiscent of the valley. Its pale straw hue with flecks of green is also the perfect accompaniment to the staple strawberries and cream that have come to be regarded as one of Wimbledon's rituals and a symbol of all that's quintessentially English. The chardonnay works well if you want to taste some sunshine while sitting courtside, but if the allure of the red is greater, the shiraz is an eager pleaser without being too rich or heavy with tasting notes of spicy berry, hints of dark chocolate and decadence. The chardonnay pinot noir NV is a favourite and works like a charm, the bubbles fraught with pregame excitement and nerves. Jacob's Creek wine maker takes us on a quick journey from vineyard to glass as we tuck into the goodness of Severn and Wye oak smoked salmon blini with poached salmon mousse and roast Lan-cashire fillet of beef, served with balsamic pickled onions and horseradish cream. To complement this delightful meal, we go the entire range from the red Sangiovese to the 2011 Reserve Barossa Shiraz. The 2012 Reserve Reisling and the 2013 Fiano lead the whites, but I am smitten by the Wimbledon blend - which has the right amount of sparkle. The meal polished off, we make our way to our seats to watch the nail-biter unfold. Wimbledon is all things English, and the dapper crowds are some of the more restrained cheer parties I have ever encountered. Silence and hushed moans of disappointment aside, the spectators measure their passion in wine-sized glasses and are never unruly. Halfway through the third set, when it looks like all is lost for Federer, a round of Jacob's Creek wine coolers are passed around, glasses iced to the rim and filled with wine and elderflower. The drink eases the blow and ignites some summer loving. It is evident that the brand has found a comfortable spot in England. Four years into its association with Wimbledon, it is a wine that's equally at home in the Royal Box as the stands outside, where picnic baskets laden with the choicest goodies are chased by a glass or two of this Australian delight. As Federer turns away desolate after Djokovic is crowned king, we head to the marquee for our last hurrah. An English tea of scones, clotted cream, strawberries and bite-size sandwiches awaits us. I instinctively reach for the crimson JC instead of Earl Grey, the shiraz rounding off the day in a way tea cannot hope to emulate. Tea may be the national drink of England, but it's only in wine that the agony and ectasy of Wimbledon finds a befitting embodiment.